This past weekend, the trustees of the Ann Arbor Awesome Foundation awarded a $1,000 grant to Virginia Lozano, an undergraduate at the University of Michigan, who, along with her twin sister Beatriz, created an education technology company called Leesta in order to “inspire 8-11 year olds by teaching American History through the stories of women.” The grant will allow the startup to complete an animated module about the work of autistic inventor and activist Temple Grandin, bringing them one step closer to their goal of releasing their first series of interactive modules in 2016. MARK: So, before we talk about Leesta, let’s talk a little about you and Beatriz. Where did you grow up? What were you like a kids? And what made you decide to attend the University of Michigan together? VIRGINIA: Beatriz and I were born in California, but grew up in Sterling Heights, Michigan. Since childhood we’ve been very close, and have loved collaborating together. We were always curious and enjoyed learning about how things worked. From an early age, art came naturally to us. We also both loved math and science, though. Having similar interests, we were both drawn to Michigan’s engineering program, which is amazing. Our time here at the University, though, has allowed us to find other, and individual, passions, like social justice and storytelling. And, the more time we spent working toward our engineering degrees, the more we realized that we enjoyed figuring out how people work more than we did mechanics. MARK: Would it be safe to assume that, in your formal education, prior to arriving at the University of Michigan, you probably learned very little about the lives, work and contributions of women… especially women of color… in American history? VIRGINIA: Absolutely. And that’s one of the main reasons we came up with Leesta. Outside of school, we had strong women as role models. Growing up, we heard stories about the hardships my mom and our grandmothers had overcome as women in Mexico, but we didn’t see that strength reflected in our textbooks, especially when it came to Latinas in America. MARK: When did the idea for Leesta first occur to you? And what made you decide to invest the considerable time and effort to pursue it? MARK: Your plan, as I understand it, is to formally launch Leesta with animated profiles of ten American women. Who are they? And how did you come to choose them? VIRGINIA: Currently, we’re working on four of the ten profiles. They tell the stories of Bessie Coleman, Dolores Huerta, Temple Grandin, and Grace Lee Boggs. The selection of the other six women is still in the works, but we’re always open to nominations. Our selection process began by gathering nominations from a broad audience, which included teachers, children, and faculty at the University of Michigan. Once we had our list of nominees, our team then began to research these women’s lives. And we also began reaching out to them personally, when possible. MARK: Can you walk us through one of your first modules… What would a kid encounter, if he or she would open the interactive timeline you’ve created for Dolores Huerta, for instance? For the rest of the interview, which details Leestas plans for the future, and how they intend to use their A2 Awesome grant, click here. On the weekend of September 4, Ypsilanti will be celebrating its third annual Festival of the Honey Bee, thanks in part to a grant by the Ann Arbor Awesome Foundation. The $1,000 award was given earlier this summer to event founder Jamie Berlin, who will be using the funds not only to grow the collaborative, multi-faceted, city-wide festival, but to produce goods which can be sold during the event, thereby making future festivals more of a possibility. “This grant,” according to Berlin, “will set us on a path to financial independence.” If you would like to know more about the importance of honey bees, how the festival came about, or what you might encounter should you attend this year’s event, check out the recent interview between Mark Maynard, the dean of the Ann Arbor Awesome Foundation, and Jamie Berlin. Last month, the Ann Arbor Awesome Foundation awarded a $1,000 grant to representatives of the Washtenaw ID Project for the establishment of an ID Scholarship Fund that will provide financial assistance to individuals in need of the County ID that cannot afford one. To find out more about the Washtenaw ID, which was created to ensure that all residents of Washtenaw County have meaningful access to a government-issued ID that validates their identity and residency, and why its so incredibly awesome, visit WashtenawID.com. Pictured above, surrounded by the Trustees of the Ann Arbor Awesome Foundation, are Keta Cowan and Janelle Fa’aola of Synod Community Services, who received the grant on behalf of the Washtenaw ID Project. In March, 2015, the trustees of the Ann Arbor Awesome Foundation awarded a $1,000 grant to Melissa Stek, a Masters of Social Work student at the University of Michigan. 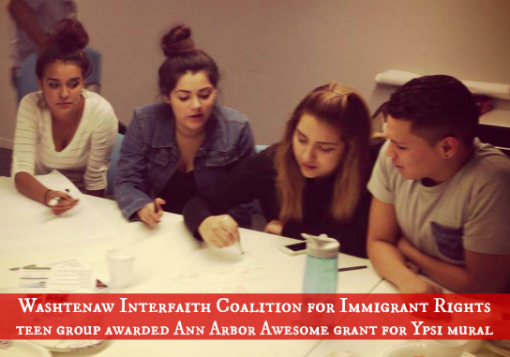 Stek received the award on behalf of the Washtenaw Interfaith Coalition for Immigrant Rights teen group with which she works. 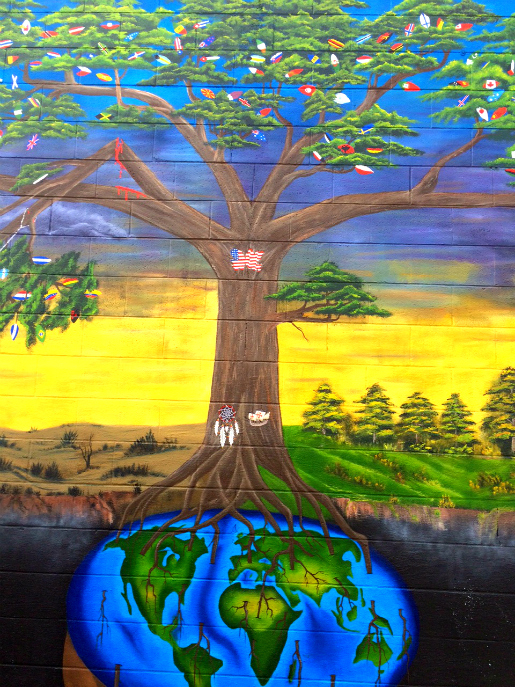 The money will fund a public mural, outside Ypsilanti’s Dos Hermanos market, on the subject of immigration. An interview with Stek on the origins of the project, the timeline for completion, and the awesome young men and women behind the initiative, can be found here. Since we last posted, we’ve awarded two more $1,000 grants toward the creation of awesomeness in the Ann Arbor – Ypsilanti area. The Resource Guide for Families, Friends and Advocates is a 36-page handbook produced by prisoner advocacy group Citizens for Prison Reform. Founded in 2011 by Lois DeMott, a Lansing-area citizen and advocate who, upon the arrest of her son, who suffers from Bipolar Disorder, was shocked to realize just how little publicly available information existed concerning the inner workings of the Michigan prison system. Families of prisoners who suffer from mental illness especially needed resources and ways to advocate for humane treatment. This A2Awesome grant is the first to be received by the organization, which, in March, is scheduled to be featured in a documentary on juveniles in solitary confinement being hosted by Ted Koppel for NBC’s Friday evening program, “Rock Center.” This grant will enable the organization to proactively reach out to those individuals in Washtenaw County entering the Michigan correctional system, making them aware of the Resource Guide, and mailing hard copies to those individuals without internet access. The organization plans to expand the program to serve prisoners and their families statewide and hopes to generate interest from additional Board Members and volunteers. Small & Mighty, according to the organization’s co-founder, Jean Henry, is “a collaborative, scrappy little nuts-and-bolts support group for entrepreneurs.” Begun in the fall of 2012, the loose collaborative of local entrepreneurs has already grown to 144 members, and hosts frequent events intended to help small business owners exchange ideas and learn from one another. “Within Small and Mighty,” says Henry, “we can comfortably share our ignorance and failures as well as our successes. We talk ‘learning curve’ all the time. I’m not sure that happens at most ‘networking’ events. Someone at a Small and Mighty gathering brought up the term ‘co-opetition.’ We are committed to each other’s success, even when we’re in the same field. We are focussed on positive relationships with each other, our co-workers, our customers, our community. Because it works. It makes our businesses better. Small businesses can harness a kind of reverse economy of scale when they work together — relationships based on trust and goodwill are more efficient — and a lot less expensive.” The $1,000 A2Awesome grant will allow Small and Mighty to build and cultivate an online presence, and to continue hosting events designed to foster collaborative, nurturing relationships between small, local business owners. With these two grants, A2Awesome has invested a total of $11,000 in the local community since its inception, making possible everything from an elementary education project involving bike-powered lighting systems to be used for the growing of vegetables, to a history project intended to capture and share the images, stories and music of local jazz musicians. On October 27, 2012, the Trustees of A2Awesome convened in the secret writing lab behind the Liberty Street Robot Supply and Repair store in downtown Ann Arbor, and handed out another $3,000 in cash grants intended to make life the Ypsi-Arbor area more awesome. The cash awards were handed over in brown paper bags to artist Trevor Stone, 826michigan’s Amanda Uhle, and photographer Bill Streety, for projects which they had submitted through the Awesome Foundation’s website for consideration. With these three grants, A2Awesome has invested a total of $9,000 in the local community, making possible everything from an elementary education project involving bike-powered lighting systems to be used for growing vegetables, to a drama program at the Women’s Huron Valley Correctional Facility based on the works of William Shakespeare. And it’s kind of shaky, as A2Awesome’s Dean was eating cupcakes as he was shooting, but here are links to video of the three recipients talking about their projects, which, thanks to these mini grants, will soon be coming to fruition. Those with creative, inspired ideas are encouraged to apply for a grant online. Grant deadlines are on the last day of each month. NOTE: AnnArbor.com’s coverage of this month’s awards can be found here. Among other things, Syncytium plans to stretch cargo netting across the inside of the dome and use it as a jungle gym, and cover it with lights, using it as a portable shelter for DJs performing in the Detroit area. “Other people,” says Perez, “may want to use it for parties, fundraisers, gatherings, or performances. They may want to hang hammocks or swings inside of it. They may want to cover it in some way, or leave it open.” Ultimately, according to Perez, she would like to see it find a semi-permanent home where it could exist as a giant instrument, filled with cords that would trigger sound, either electronically or mechanically, when tugged or clambered upon.